Cityskin is Australia’s leading clinic for double chin injections. We offer double chin treatment at our clinics in Melbourne and Sydney with medical experts. Consultations are free and double chin treatment costs from $600 per vial. 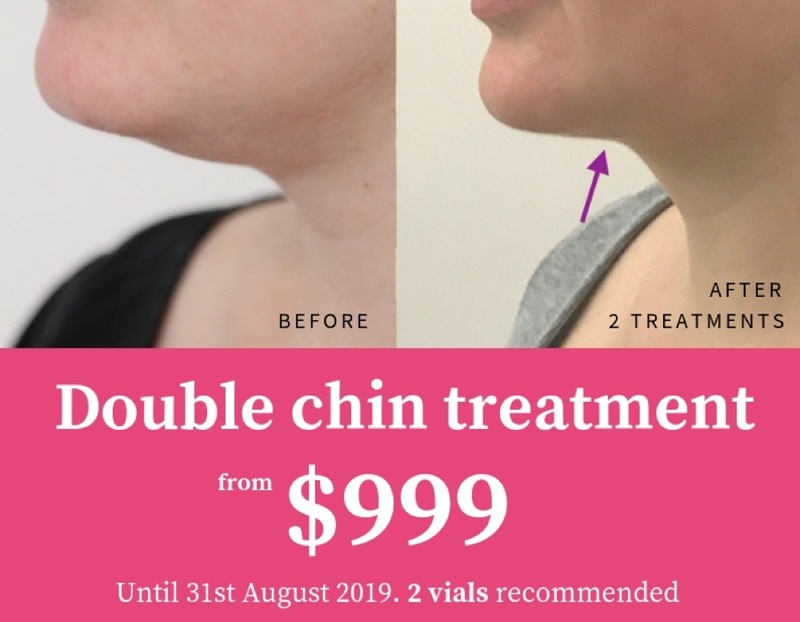 Until 31st August 2019 double chin treatment costs from just $999 (recommended 2 vials). What is actually in the double chin treatment vials? Double chin injections vials contain an acid which is found naturally in the body. This acid is similiar to the one released by the gallbladder that helps dissolve fatty foods when you eat them. Double chin removal – how do double chin injections actually work? The product is injected into the fat in the double chin area and permanently destroys the fat cells by a process known as adipocytolysis. Once the fat cells have been destroyed they cannot store fat again. Imagine your fat cells are balloons and double chin injections are darts. Injecting the product under the chin is like throwing a dart at fat cells. Once they have been popped they cannot be blown up again. Who is best suited for double chin injections? 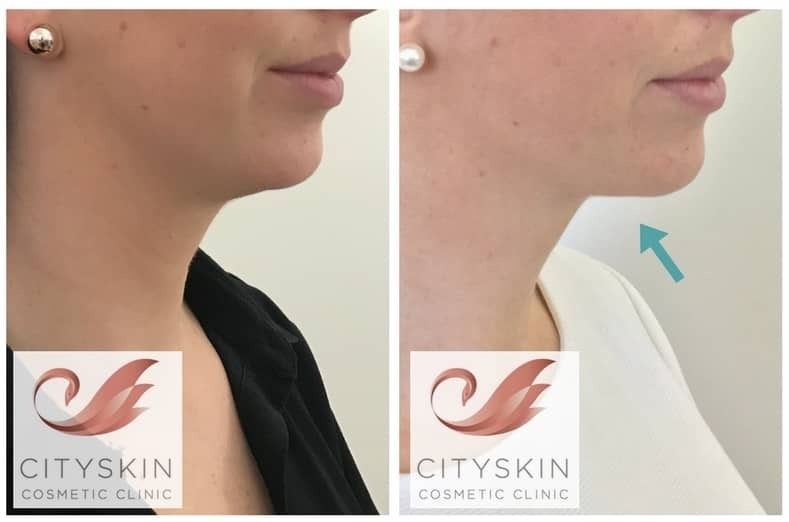 With this in mind the majority of the patients that we treat at Cityskin have a mild fullness under the chin (1 on the scale below). This is one of the most common questions that we are asked by patients enquiring about double chin injections. The video below shows Dr Brown from Cityskin discussing how many vials you are likely to need for your treatment using handy objects for size comparison! The video above shows the how large an area 1 vial, 2 vials and 3 vials can treat. You can do the ‘pinch test’ in-front of the mirror to estimate how many vials you might need. The fullness under the chin that we can treat is where you can pinch a little finger’s width of fat between your finger. 1 vial of double chin injections will approximately treat the area of a 50 cent coin. A small number of patients fall into this category. 2 vials of double chin injections is approximately the same area as a packet of chewing gum. Most patients fall into this category. 3 vials of double chin injections is approximately the same width as a Myki or credit card. How treatments will I need? We recommend at least 2 treatments in order to see results. Some patients need up to 4 treatments to see full results. The number of treatments that you need depends largely on the amount of fullness that you have under the chin. These treatments are usually placed around 8 weeks apart. Who is not suitable for double chin injections? If you have a lot of loose skin under the chin then double chin injections may not be effective. If you have an active infection of the skin under the chin then you cannot have treatment. What does it feel like to have double chin treatment? How much swelling occurs after treatment? 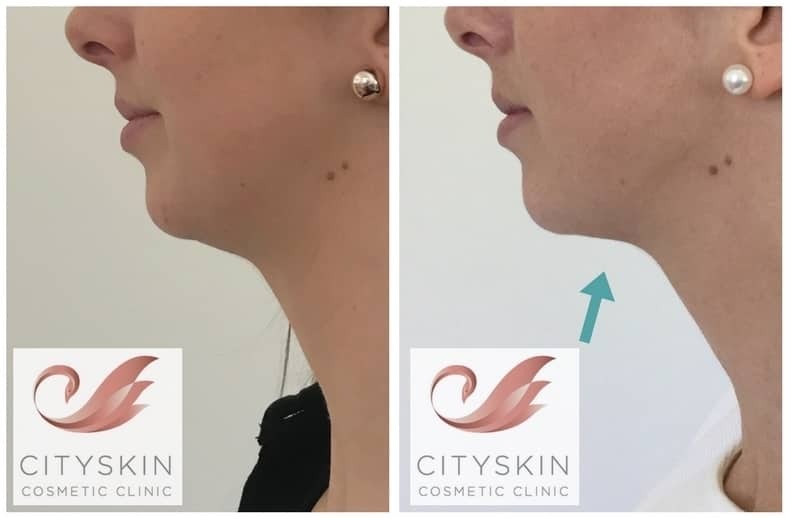 The video below shows the swelling that occurred 20 minutes after double chin injections at Cityskin. The patient received 2 vials of product and 3ml of local anaesthetic. The amount of swelling that occurs can vary but this is a good representation of how much swelling you will see with 2 vials. All the patients shown below have had double chin injections at Cityskin. This patient had 2 treatments 8 weeks apart using 1 vial. This was the first patient that we treated at Cityskin. She had 2 treatments using 2 vials each time. The patient had 1 vial of double chin injections and results were seen after just 6 weeks. This is not the norm- we usually see results taking a litle longer and with 2 or 3 treatments. The vast majority of side effects from double chin injection treatment are mild and not permanent. Studies show that with each treatment side effects occur less frequently and to a lesser degree. Swelling around the area injected – We expect to see swelling. It means the treatment is working! In fact, we say please call us if it does not swell. We recommend not going back to work on the day of treatment and using ice on the neck intermittently in the hours after treatment. Temporary numbness under the chin. Approximately 50% of patients will feel this slight numbness after treatment, with symptoms wearing off after 30 days on average. Warmth and redness – 40% of patients will feel warmth or redness under the chin on the day of treatment. Firmess under the chin – Studies show that 16% of patients will feel firmness or ‘induration’ under the skin after treatment. This is not a worrying symptom and resolves, on average, after 51 days according to studies. Rarer side effects such as temporary problems with weak smile and facial muscles and trouble swallowing (2%) have been reported. The risk of affecting the smile is due to the small chance of temporarily affecting the marginal branch of the facial nerve. The anatomy of the nerves in the face differs from person to person and in 2% of treatments a small branch of the facial nerve can be affected. This would present as a temporary problem with the smile muscle (see image below). The affected side would be more difficult to perform a full smile. The problem is temporary and the average time to resolve is 44 days. Double chins can run in families – just as some people gain weight around the hips there may be a genetic predisposition to laying down fat under the chin in your family. Gaining weight can contribute to the amount of fullness under the chin so we always recommend a healthy lifestyle with exercise and dietary changes to keep your weight in the ideal range. What is the name of the product? The product has different names in the USA and Australia but it is essentially the same product. Frustratingly, we are not allowed to mention the name of the product on the website due to Australian law. We have to call it ‘double chin injections’ instead of using the actual brand name. Are double chin injections painful? A number of small injections using tiny needles are made into the double chin area. We use local anaesthetic to numb the double chin area before injection. This means that when we treat the area with the double chin injections you can barely feel it. After an hour or so, when the local anaesthetic wears off, it can feel fuller under the chin and you may feel a slight ache. We recommend using panadol and icing the area to reduce the discomfort. Remember not to leave the ice on the skin for more than 10 seconds at a time to reduce the risk of a cold burn. Are double chin injections safe? Yes. It is a non surgical treatment with an acceptable side effect profile. Does the product permanently remove double chin fat? Yes – double chin injections permanently destroys double chin fat. Once the fat cells have been destroyed they will never return. Am I guaranteed to see results? 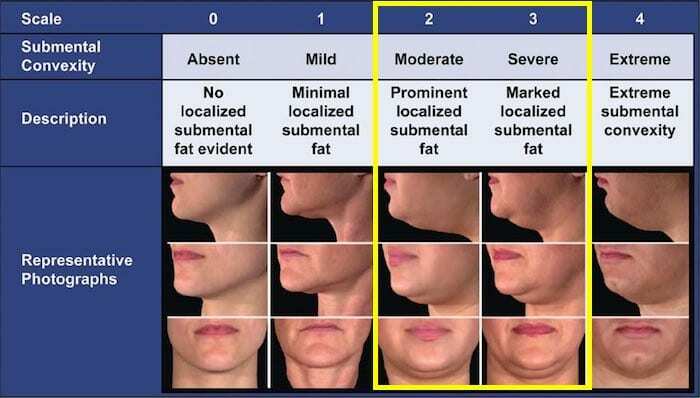 68.2% of patients noticed at least a 1 grade or more improvement in the fullness of their double chin area (see scale below) and 16% of patients noticed a 2 grade or more improvement in double chin fullness. How many vials do I need to treat my double chin? The average patient needs at least 2 vials injected into the double chin fat at each treatment. We recommend at least 2 treatments of at least 2 vials to see results. When will I see results after double chin injections? It takes up to 6 weeks for you to notice the effects of double chin injections. For some patients it may take longer to see results – in some cases a couple of treatments before you see results. Are double chin injections safe in pregnancy and breastfeeding? We do not recommend double chin treatment in pregnancy or when breastfeeding. Do double chin exercises work? Double chin exercises do not reduce double chin fat. Double chin exercises are meant to tighten the platymsa muscle (neck muscle) but we don’t think you should spend your time doing them. Which Cityskin Clinics offer double chin injections? We offer double chin injections at Cityskin clinics across Melbourne and Sydney. How often should I have double chin injections / treatment? 8 weeks is a good time to come back for your second double chin treatment. We cannot inject the next treatment any sooner than one month after your last treatment. If for any reason you cannot come back at 6 weeks after your initial treatment, you may still come after the 6 week mark without it causing any negative impact on your treatment outcome. Dr Brown usually explains this kind of like chipping away at a stone. You don’t have to do it all at once, as what you’ve “chipped away” will still be like that atfter 6 weeks. It just depends how quickly you want to achieve the number of recommended treatments for results. How long does double chin treatment take on the day? The actual injections for double chin treatment only takes about 5-10minutes. At Cityskin, we use anesthetic to numb the area first, as this particular treatment without any anesthetic should quite uncomfortable. Depending on the size of the area will depend how many injections you will receive. The injections for double chin are spread out in a 1cm grid to cover the marked area within the ‘safe zone’. Each one of these injections only take a few seconds, much like anti-wrinkle injections.